This dish is what I consider one of my “single-girl” suppers. I made a million variations of it in the tiny kitchen in my former apartment. I mastered the amount for one supper and one lunch for the next day and made it weekly. As anyone cooking for one knows, eating the same thing for days is the pits (although I also know that this dish freezes and reheats well). I’ve made it with penne, bowties and quinoa. I’ve made it with shrimp, chicken and scallops. I’ve added asparagus, mushroom, kale, and tomato. It is simple, flavorful and season-less. Though I am not a single girl anymore, I recently remembered my old standby and excitedly whipped it up. After getting rave reviews from my Main Taste Tester I have a feeling that no matter what phase of life I am in, or what version I make, it will still be a favorite. Mix shrimp with olive oil, parmesan, brown sugar, soy sauce and garlic in a container or large Ziploc bag. Marinate in the refrigerator for at least two hours or overnight. When ready to eat, put a large pot of water on to boil. Once boiling, add the pasta and broccoli. Pour the shrimp and marinade into a large skillet on medium heat and cook until heated through and sauce has thickened. Turn heat to low. 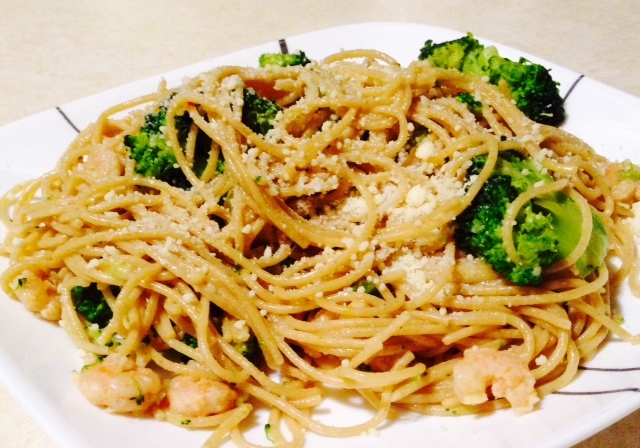 Once pasta is al dente and broccoli is cooked, drain and add to shrimp mixture in skillet. Stir around to coat the pasta with sauce and disperse shrimp and broccoli evenly. At this point I taste and usually add a little seasoning salt for zip. Once mixture is combined and seasoned to your liking, garnish with extra parmesan and serve!